Some Fond du Lac County residents stumbled across what would have been a sturgeon spearer&apos;s dream fish last weekend along the shores of Lake Winnebago. The female sturgeon washed up on shore just south of Pipe. DNR Sturgeon Management Supervisor Ron Bruch says it was 81.5 inches long and weighed about 140 pounds. He says the fish had been shot by an arrow; likely from a bow fisherman out shooting carp. The fish had been dead about a week, but Bruch says judging from the decomposition of the insides had died a slow painful death. "The fish was internally injured quite severely," Bruch says. Bruch says when it was carrying eggs, the enormous sturgeon probably weighed in the neighborhood of 200 pounds. 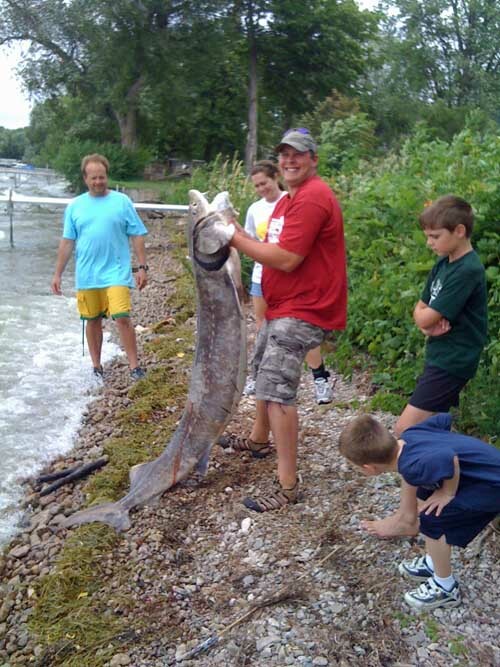 He notes the largest fish ever speared on Lake Winnebago was a 188 pounder in 2004. "We handle a thousand fish every spring, and we usually see maybe one that big," he adds. Bruch says it&apos;s difficult to say if the fish&apos;s death is the result of an accident or intentional: "in any event, it was nice fish that died, and it&apos;s a shame." DNR records indicate the fish was tagged at the Shawano Dam in the spring of 2004. Bruch says at the time it was 76 inches long. He estimates it was between 70 to 100 years old.